A loud portion of the House Republican conference was not happy with representatives from the Trump administration during a messy-sounding meeting Friday morning. The meeting was designed to sell GOP members on a package that allocates roughly $15 billion in relief for Hurricane Harvey, suspends the debt ceiling for three months with no offsetting spending reductions, and funds the government for the same amount of time. The biggest sticking point for many conservative GOP members was the "clean" debt ceiling suspension. Republicans advocated for years under President Barack Obama that any increase in the debt ceiling should be accompanied by spending cuts to address the nation's ballooning debt. Two top administration officials — Treasury Secretary Steven Mnuchin and Mick Mulvaney, the director of the Office of Management and Budget — were in attendance to sell members on the deal. According to members speaking to reporters following the meeting, Mulvaney — a former member of the hardline conservative House Freedom Caucus — was booed when he began speaking, though some members said it was good-natured. "Let's face it, he was booed when he was here," Rep. Scott Perry, who ended up voting against the package, told the AP's Erica Werner. Mulvaney was also jeered when he would not commit to including deficit reduction measures in a future debt ceiling bill, according to Politico's Rachel Bade. 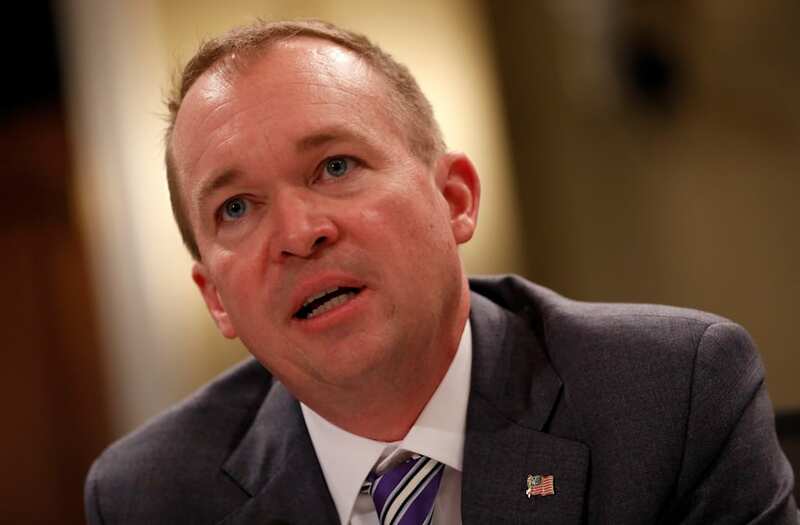 During his time in the House, Mulvaney helped lead the conservative cries for spending reductions as part of debt-ceiling increases in 2011 and 2013. Rep. Thomas Massie, who voted against the bill, told reporters Mulvaney's request for a clean raise was "ironic, but not hypocritical, but very, very, very, very ironic." Other members directed ire at Mnuchin, who left in the middle of the meeting for another event. Rep. Mark Walker, head of the conservative Republican Study Committee, was particularly incensed with the final pitch from Mnuchin. "His last words, and I quote, were ‘Vote for the debt ceiling for me,'" Walker told reporters after the meeting let out. "You could hear the murmurs in the room there. There was some hissing and I don’t know if there was booing but there were some groans." The RSC sent a letter to House Speaker Paul Ryan asking for significant changes in order to secure their votes for the bill, none of them were adopted. Walker voted no. "When you have a Democratic donor Treasury secretary saying we as a Republican Congress need to vote for this and an OMB director I don’t believe ever supported a clean debt ceiling … say we need to do this, it’s kind of, 'Where am I right now?'" said Rep. Ryan Costello, who eventually voted for the bill. Costello added that Mnuchin's pitch was "about as well received as his wife's Instagram post." The package eventually passed the House, with 90 Republican members ended up voting against it. It now heads to the president's desk.